For a politician, being close to the people means constantly being present in their struggles. In the opinion of José Bové, going institutional can only work if the members of the Green movement don’t forget to “persevere radically”. GEJ: You have stood beside activists and participated in numerous demonstrations throughout Europe, in Hungary, the United Kingdom, Poland, and France. What are the major issues and challenges facing the world today? José Bové: There are currently a number of important demonstrations taking place around Europe. First, there is a lot of mobilisation related to territorial issues, for instance, protection of rural areas and nature… There has been an increase in this type of activism around Europe and this is clearly a very important course of action in the quest to fend off industrial, infrastructure and commercial projects. Perhaps the most emblematic example of this is the plan to build an airport near Nantes at Notre Dame des Landes (dairy farmers, locals, and environmental activists are protesting for years now, as the €556m airport would lead to a loss of homes and a precious woodland). The Lyon-Turin high-speed train connection (a 270 km-long railway line in; the Italian No TAV Movement is protesting against its environmental and health risks since 1995), is also an excellent example of the fight to defend a territory against a specific project. There have also been instances of small-scale demonstrations against the construction of supermarkets. The mobilisation to fight open-pit coalmines in Germany is apparently gaining impetus. Destruction of a territory is something that mobilises categorical rejection and opposition. This has taken the form of opposition to airports, coal mining, or shale gas (in Great Britain)… The reason for the increase in this type of activism is simple. There are differing reasons motivating each fight but they all have one thing in common. In each case, there is an affront to something essential like water, land, or natural resources. Moreover, resistance grows stronger as people come to realise: “we could actually win this one!” Each fight is local but the sum of all of these local fights equates to the rejection of a given model. The fact that I was arrested and then the power game I played turned out to be very effective – I refused to post bail and in doing so flipped the logic around: I decide when I get out of jail and not the authorities. Are these just simply cases of NIMBY (Not in my Backyard)? Or is it more than that? Promoters often claim that the protest is just a case of NIMBY. Obviously, awareness is piqued when the land to be destroyed is “your” land. And people have every right to take part in decisions affecting the economic future of their territory – big or small. Resistance of this type is legitimate. Frequently, it is the only right that people have left: they no longer have any control over their wages, jobs, etc. When it comes to their land, however, people can still act: they can stand up and say “you will never destroy the water and land on which I stand.” These are the things that mobilise people; and this expands the mobilisation beyond traditional activists or political groups. We are dealing with concrete issues here and that creates a community dynamic, which in turn, creates alternatives. That is what is interesting. The fight for land and territory often brings about concrete thinking on what type of alternatives exist: alternatives for energy, transport, and consumer habits… These communities, through debate, find the right thought process to shake free of the NIMBY mentality. At times, as was the case in France recently, the people who spearheaded the fight have gone on to be elected to local government. The vitality and diversity of activism across Europe is tied to the fight to defend a land, a territory. For example, initially the demonstrations in Bulgaria, Romania, and Poland – aimed to fend off a land grab by the extractive industries (shale gas, gold mining, etc.). Sometimes it seems as if these movements are piecemeal. Yet, when we take them all together we realise that there are solid networks out there. These are not examples of just short-term election campaign politics. In addition to environment-related mobilisation there has also been a lot of activism related to social issues, specifically in Southern Europe. There is a difference. Of course there is some overlap, i.e., the rejection of a model, but the end result is the setting up of an alternative – cooperatives for example. And there is a lot of social turmoil surrounding these movements. From time to time we get good news: the election in Catalonia of Ada Colau, a member of the Indignados from the Barcelona anti-eviction campaign, for example. When the time comes to get involved in politics everything gets much harder because you immediately come face to face with a nearly insurmountable challenge: it is very difficult to offer alternatives to the European construction process in its current conception based on the mainstream liberal economic model. For instance, Greece has been gradually forced to make concessions and the Greek government made to adapt. In Spain, Podemos had to dial back its anti-hegemonic-system designs in favour of realpolitik and entering coalitions. Inevitably this will be a source of frustration. 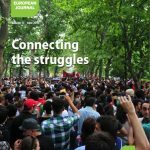 Therein lies the challenge and complexity of a movement like the Greens in the broadest sense of the term: striking the balance between leading radical struggle and being pragmatic as to the alternatives – with – why not – attempts at forging compromise – without of course caving in on value of fundamental importance. I believe that there currently exist two major global struggles that are not linked to a given territory: TAFTA/TTIP and climate change. The fight against free trade has always been one of your major causes. The idea behind destroying the Millau McDonald’s in 1999 was to attack a symbol. The mobilising symbolism of water and land is easy to see: they both affect us directly. What sort of symbol exists for the climate, which can seem overly abstract? That is precisely what is challenging about the climate. When it comes to TAFTA, the concrete harmful effects are easily discernible: GMOs and food, for example. How can we establish a strong resolve on something the effects of which are very slow (except of course in moments of acute crises, like drought or severe storms) and delayed? It is very difficult to organise the mobilisation. That is why I believe that the climate movement can and must join forces with the anti-free trade movement. The role of multinationals in destroying the climate is overwhelming, in terms of energy, industrial farming, transport, etc. What’s more, all of the economic structures in place are designed to expand the space and the power of multinationals. Therefore, the fight against climate change must inevitably challenge the dominant economic model; failing to see the link between the two would be tantamount to greenwashing. We will need targeted actions to put pressure on all the stakeholders. A good recent example of this was the Anglican Church’s decision to divest in gas and oil. This is not a street protest, of course, but had there not been all of the protests in the lead up to this decision, the pressure on the church would not have been there. We have to continually make the connection between the two. The vitality and diversity of activism across Europe is tied to the fight to defend a land, a territory. You were arrested after the incident at McDonald’s. Activists are arrested every day for their actions in the field. Are you under the impression that there is a crackdown on protests and activism? If we take the examples of Notre Dame des Lands and Sivens, do you believe that the French government is an example of stringency in its approach? That is a question of strategy essentially. In general, nations and economic powers are not very fond of dissent – it makes sense really – because it runs counter to their interests. So, when you contest a model – the first thing – and the most important to me – is to win over the general public, otherwise it will be impossible to create a power struggle. Therefore, the strategy must aim to convince the widest public possible; that is the only way to flip the logic of repression, vis-à-vis the State. That also means that some forms of action are counterproductive: radicalisation, violent clashes, Molotov cocktails are not conducive to winning over public opinion. Back at the time of Larzac (a movement protesting the expansion of a military camp, which would have led to the displacement of farmers), if we’d have tried violence against the army we would have lost. With the army on the other side it was clear that we had to convince people that “armed” resistance made no sense. I am convinced that a strategy of non-violence is essential in all of these battles. That is not to say that we are doing nothing. It just means that we are trying to come up with the best approach to resistance. For example, in Notre Dame des Landes, the blockade was maintained non-violently, i.e., through the establishment of a demarcated area to defend known as a ZAD (for the French Zone à Defendre), areas that were occupied (essentially the same thing: occupy an area to prevent construction, to block the process). A small minority in Notre Dame des Landes became radicalised, which brought on an exaggerated deployment of law enforcement. The out of proportion reaction prevailed despite all of the solidarity and reinforcement of people. It could have gone the other way. All of these actions are symbolic and aim to grab the attention of the greater public, very often they get run through the media, which serves as a conveyor belt of information. The problem is, we never know ahead of time, precisely what is going to serve as a trigger. In my opinion, the long term future of political ecology will only be ensured if it is able to persevere radically –in discourse (that is of course necessary) but not only. It will also have to be radical in its actions. Often, like with McDonalds, the arrest and jail time were what resonated with the general public. The actual dismantling and rally cry of “The WTO is taking over our plates” could have been completely lost had it not been for the subsequent reaction of law enforcement. The fact that I was arrested and then the power game I played turned out to be very effective – I refused to post bail and in doing so flipped the logic around: I decide when I get out of jail and not the authorities. Ultimately, American farmers from a Via Campesina union posted bail for me stating that they supported the effort. In doing so they added breadth to the story. In a case of non-violent civil disobedience, repression is part of the action. Jail time strengthens action and builds the movement, things happen because we force the state into the trap of a repressor. With the issue of the relationship to power comes the question of political parties. 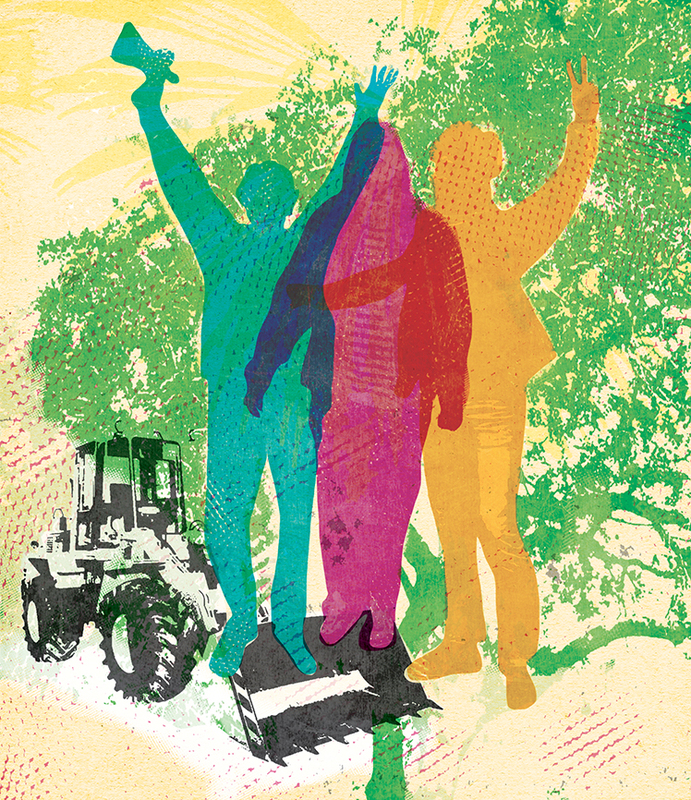 Political ecology has its roots in activism. However, recently, activist movements seem to have become side-lined or even rebuffed the Greens. Was this inevitable? The problem goes back to the setting up of political parties. The pan-European anti-nuclear movement of the late 1970s – protest through concrete action – served as the foundation for the European Greens. The battles on the ground and the demonstrations built the idea that there needed to be a way to fight politically too and therefore a need to establish a political wing as emissary of these ideas. Any movement that decides to establish a political entity is immediately forced to grapple with the following question: do you go institutional or do you dissolve? If the decision is made to go institutional as a political party in the public space, two options are available: go forward in compliance with all of the codes that be or persevere radically, by taking a slight step to the side. In my opinion, the long term future of political ecology will only be ensured if it is able to persevere radically –in discourse (that is of course necessary) but not only. It will also have to be radical in its actions. The problem is that the Green parties that exist today are essentially parties of elected officials, and not parties of activists. Therefore, the political wing revolves around those who are sitting members of assemblies – local and national – and not around those who are working in activism daily. Perhaps that is why those actively fighting every day do not necessarily relate to the Greens and do not necessarily expect them to come up with the solutions or to support them in their fight. Because those who embody the political movement, are not considered, rightly or wrongly, those who embody the protest or those who are able to stand up to the powers that be. Therefore, the elected officials and political leaders of the movement must always be able to shake things up and be “just a step off to the side.” They must remain tuned in to social movements and to what people are really thinking in society. Movements of political ecology run the risk of shifting too far into the institutional side of things and then forget to stay tuned into the rest. I believe that there currently exist two major global struggles that are not linked to a given territory: TAFTA/TTIP and climate change. To wrestle back and to own this ideal again will mean being able to be active in the field, to be a reliable conduit for the major societal concerns and to be able to transform those concerns into acts. Being close to the people means constantly being present in the struggles that they embody, in the area of energy, farming… We cannot expect to win every time, but we must be able to give body to the fundamental stories and subjects when the expectation is there and when we are able to move the lines. The Greens must show constant indignation and ire when a subject means something to the people; not to strike compromise, but to lead a true battle. Considering all the weaknesses of the European political system – insufficient democratic accountability and overly powerful lobbies, such as you have written about in your book Hold up à Bruxelles, how do you envisage the future of activism? Are you more optimistic or pessimistic? I always strive to be an “active pessimist”. When you look at how the world works and you see that the forces have coalesced around a project that is diametrically opposed to ours, the obvious conclusion is that you are never going to prevail. And yet, we are making progress; we are winning battles. Even in the area of climate change – the fact that it is even an item on the agenda is an amazing accomplishment. It has become one of the major planetary political issues, thanks to the 40-year process of re-evaluating our models for growth, energy, and consumption. Political ecology’s major victory is to have forced fundamental issues onto the political agenda. Over the last 40 years, we have clearly shown our ability to get our issues addressed. The message is clear: we must continue unrelenting in our combats on the ground and in our efforts to make sure that all of those endeavours coalesce.